§ 420.010 Purpose, Scope and Applicability. § 420.050 General Requirements Applying to All Signs. § 420.060 Types Permitted by Zoning District. § 420.070 Additional Permitted Signage. § 420.080 Subdivision Monument Signs. § 420.090 Regulations Relating to Billboards. § 420.100 Removal of Abandoned and Illegal Signs. § 420.130 Conditional Use Permits. § 420.150 Appeals and Variances. § 420.160 Permitted Signs by Type and District. § 420.180 Number, Dimension, Location and Duration of Temporary Signs. Section 420.010 Purpose, Scope and Applicability. Section 420.050 General Requirements Applying to All Signs. Section 420.060 Types Permitted by Zoning District. Section 420.070 Additional Permitted Signage. Section 420.080 Subdivision Monument Signs. Section 420.090 Regulations Relating to Billboards. Section 420.100 Removal of Abandoned and Illegal Signs. Section 420.130 Conditional Use Permits. Section 420.150 Appeals and Variances. Section 420.160 Permitted Signs by Type and District. Section 420.180 Number, Dimension, Location and Duration of Temporary Signs. The purpose of this Chapter is to provide minimum standards to safeguard life, health, property, property values and public welfare by regulating and controlling the quality of materials, design, construction, installation and maintenance of signs, advertising devices and outdoor display structures, together with their appurtenant and auxiliary devices, in addition to the location, number, color, size, sign type and type of illumination of all signs and sign structures located on private property. The ban of all signs on utility poles, public rights-of-way and other public property (without the consent of the owner of the public property, i.e., City, County, State or Federal Government) and which sign regulation generally is necessary to protect the safety of workmen who must scale utility poles, to eliminate traffic hazards thereby helping to ensure public safety and to preserve the aesthetic appeal of the City by eliminating clutter and visual blight. The zoning regulations of the City of Bowling Green (Chapter 405 of the City Code) shall govern the area of the City in which any sign, sign structure or advertising device shall be located. 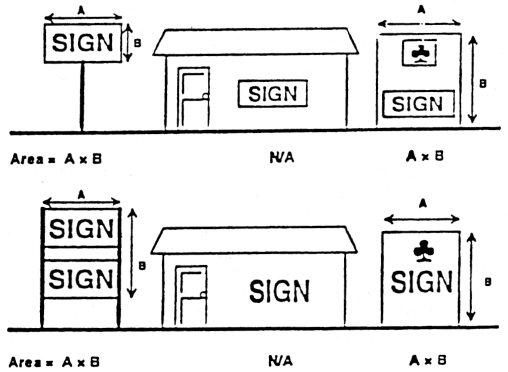 In the absence from this Chapter of specifications governing details of sign construction, the applicable standards listed in the City's Building Code (Chapter 500 of the City Code) shall govern. The regulations and requirements of this Chapter apply to all signs that are or are intended to be viewed from a public right-of-way or adjacent property or that are intended to be viewed from outdoor areas of public property, except as otherwise exempted under this Chapter. Signs shall be permitted only in conformance with these regulations or as otherwise provided for non-conforming signs under the provisions of this Chapter. BANNER — A temporary paper, plastic or cloth device hung or installed to attract attention to and associated with a temporary event. PENNANT — Any lightweight plastic, fabric or similar material suspended from a rope, wire or string, usually in series, designed to move in the wind. Any device entirely supported by the wall to which such device is attached and which has a frame covered by canvas, cloth or other similar temporary material and which may be retracted or rolled to the structure by which such device is supported. A sign that directs attention to a business, commodity, product, service or entertainment conducted, sold or offered at a location other than the premises on which the sign is located or on the premises upon which the sign is located. AWNING SIGN — A sign imposed or painted upon an awning. 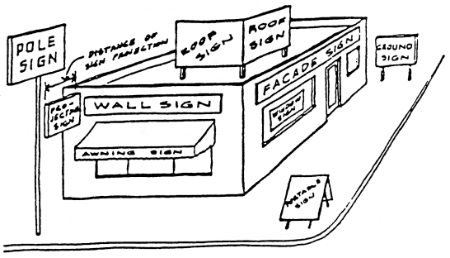 FACADE SIGN — A sign affixed to, integral with or displayed upon a facade. INCIDENTAL SIGN — A sign containing an announcement or other display providing information about the occupancy or conduct of business permitted on a premises, such as logos of credit cards accepted on the premises, hours of operation, closed or open, emergency contact person name and telephone number, street address, help wanted, no loitering or solicitations, security system notices, notices required by law and similar information. MARQUEE SIGN — A sign attached flat against a marquee or permanent sidewalk canopy of a building and not extending above the roof line. PROJECTING SIGN — A sign affixed to a wall of a building and extending more than one (1) foot from the surface of such wall, usually perpendicular to the wall surface. ROOF SIGN — A sign that is mounted on, applied to or otherwise structurally supported by the roof of a building. UNDER CANOPY SIGN — A sign or advertising device attached to the underside of a marquee or canopy and protruding over public or private sidewalks or rights-of-way. WALL SIGN — A sign that is fastened directly to or is placed or painted directly upon the exterior wall of a building and extends from the surface of the wall no more than twelve (12) inches. WINDOW SIGN — A sign that is placed on or behind a windowpane and intended to be viewed from outside the building. Use of a sign or advertising device so designated by this Chapter which may be permitted under certain established conditions after review and approval by the Board of Aldermen according to the provisions of Section 420.130 when the Board of Aldermen determine that the location and design of the sign or advertising device is not in conflict with the purpose of this Chapter and that the necessary safeguards for protection of surrounding property and neighborhood values are provided. A temporary sign used during construction of new buildings or renovation of existing buildings identifying the contractors, engineers, architects or financial institutions involved in the building construction or development. A sign that presents a message through illumination of flashing, intermittent or moving lights forming the letters, numbers or symbols of the message, whether or not the message appears to move across the sign face. A depiction or drawing drawn to scale showing horizontal and vertical elements of a building or structure including, but not limited to, walls, roof lines and other architectural features. A sign used to safely direct vehicular traffic into or out of a property or to or from a business via a driveway from a street. The front of a building or any side facing a public way or space, especially one distinguished by architectural treatment. GROUND SIGN –– A freestanding sign, other than a pole sign, in which the bottom of the sign face is less than six (6) feet above the ground, but is not directly in contact with the ground. MONUMENT SIGN — A freestanding sign in which the entire bottom of the sign is in contact with the ground, providing a solid and continuous background for the sign face from the ground to the top of the sign. POLE SIGN — A sign that is mounted on a freestanding pole or other support so that the bottom edge of the sign face is above grade so as to expose the pole or support structure. FULLY ILLUMINATED SIGN — An illuminated sign, the sign structure of which is lighted by an external or internal source that is visible. INDIRECTLY ILLUMINATED SIGN — An illuminated sign that is partially or completely lighted at any time by an external light source that is shielded and not visible at eye level. INTERNALLY ILLUMINATED SIGN — An illuminated sign that is lighted internally over the entire sign face area by use of electrical or other artificial lighting. A sign that is intended to be expanded by air or other gas for proper display or support. Any permanent roof-like structure projecting beyond a building or extending along and projecting beyond the wall of a building, over an entrance, as to a theater. A sign that contains two (2) or more sign face surfaces that are located on different sides of the sign and are separated from each other at their nearest point by no more than three (3) feet. A single office, commercial or industrial property that is designed or intended for occupancy by two (2) or more businesses. Any sign or advertising device which was lawfully in use at the time of passage of this Chapter or amendments thereto that does not meet requirements of this Chapter or amendments thereto. A sign or advertising device placed or maintained by or on behalf of a governmental body, governmental agency or public authority, such as traffic signs, signals or regulatory devices or warnings; official emblems, public notices or official instruments; indicators of historical interest sites or designating areas of architectural or historic significance or gateways. A sign or advertising device that is not permanently affixed to one (1) location and has the capability of being readily moved or relocated. Portions of U.S. Highway 61, U.S. Highway 54 and Business 61 located within the corporate limits of the City and such other routes or route segments as may be designated from time to time by the Board of Aldermen by ordinance, together with the rights-of-way of each. A sign located at a discernible entrance into a particular subdivision, development or office or industrial park. Any object, device, display or structure or part thereof that is used to advertise, identify, display or attract attention to an object, person, institution, organization, business, product, service, event or location by any graphic or similar means including, without limitation, words, letters, figures, design, symbols, fixtures, colors, illumination or projected images. The area or display surface of a sign used for a message or to otherwise communicate information. The vertical distance to the highest point of a sign structure as measured from the average grade at the base of the structure or directly below a projecting structure. All elements of a freestanding sign or billboard, including the sign face, background or decorative elements related to the presentation of the sign's message and the structural supports. Any sign made of a material such as cardboard, paper, pressed wood, plastic or metal that is attached to a fence, tree or a utility pole or similar structure. A monument sign that is located at an entrance of a residential subdivision and is associated with identification of the subdivision. Designed for easy removal or not capable of withstanding the weather for at least twelve (12) months. A political campaign, referendum or ballot proposition put to the voters as part of City, State or Federal governance. The offering of a property or premises for sale or lease. The construction of a building or development project or the rehabilitation, remodeling or renovation of a building. One who possesses or occupies land or buildings by title, under a lease or through payment of rent; an occupant, inhabitant or dweller of a place. Coordinated drawings and specifications that establish a unified design concept with regard to the location, materials, size, letter style and color of all signs and advertising devices to be placed on a property. Interior window signs and interior window displays. Brand names or logos on products, product containers or dispensers that are an integral part of the product or the product's packaging. A building design, color or motif that is associated with a particular establishment or organization, but that conveys no commercial message. A sign limited in content to the street name and address number of the building or property to which it is affixed, provided that the sign consists of lettering no larger than five (5) inches in height on a building or three (3) inches on a mailbox. Displays erected on a seasonal basis in observance of religious, national or State holidays, which are not intended to be permanent in nature and that contain no commercial message. Signs intended to convey a legal right or restriction on a property, such as "no trespassing" or "no hunting". Signs intended to warn the public of a bona fide danger on the property, such as "beware of the dog"; or a sign placed by order of a court or by a government official in the normal course of their duties, such as posting of a legal notice or a "building condemned" placard. The following signs are prohibited in any zoning district and may be removed by order of the Administrative Officer. Pennants which remain more than ten (10) days within any continuous ninety (90) day period at the same premises or address. A sign mounted on a trailer, with or without wheels, with the exception of factory manufactured two (2) sided changeable letter board with or without lighting. An "A-frame" or "sandwich board" sign when used or located outside the "B-2" zoning district. A sign which is more than twelve (12) inches in height and is mounted or painted upon a parked vehicle that is positioned for the primary purpose of acting as a sign exposed to the public and is not in use in the ordinary course of carrying out its transportation function. A sign mounted or painted upon a vehicle that is operated on public streets for the primary purpose of presenting a message or symbol offering or supporting the sale, rent, lease, loan or other availability of any property, product or service and is not otherwise in use in the normal course of transporting people, merchandise or freight. Any sign or advertising device that emits or utilizes in any manner any sound capable of being detected on any traveled street or highway by a person with normal hearing; or any sign or advertising device that emits smoke, vapor, particles or odors. 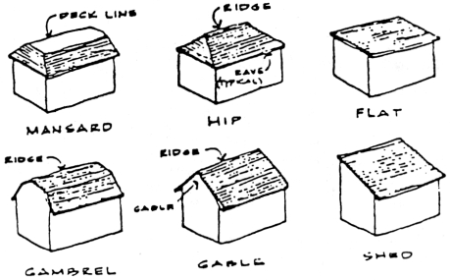 Any roof sign which extends above the top edge of the parapet or eaves of a flat or shed roof; the ridge line of a gable, hip or gambrel roof; or the deck line of a mansard roof. Any sign or advertising device, other then an official sign, which is posted or erected on a utility pole or any other public or private property within a public right-of-way. Any temporary painted wall sign. Any temporary exterior window sign displayed beyond thirty (30) days. In addition to the sign permit required by this Chapter, a building permit shall be obtained from the Administrative Officer prior to installation or placement of any freestanding sign having a sign structure area greater than fifteen (15) square feet or any building sign having a sign face area greater than six (6) square feet. All signs for which a building permit is required shall be constructed and maintained in conformance with all applicable Building Code (Section 500.010 of the City Code) and Electrical Code (Section 500.130 of the City Code) requirements. All signs utilizing internal lighting or other electrical devices or circuits shall display a label certifying such lighting as being approved by the Underwriters Laboratories, Inc.
All electrical services to a sign shall comply with the Electrical Code (Section 500.130 of the City Code). Clearance from all electrical power lines shall conform to the requirements of the Electrical Code (Section 500.130 of the City Code). All signs, together with all their supports, braces, guys and anchors shall be kept in good repair and, unless constructed of galvanized or non-corroding metal, shall be given a protective coating as necessary to maintain a clean appearance and safe condition. All signs shall be maintained in accordance with all City ordinances, including ordinances regulating nuisances and vegetation. Freestanding Signs. Each freestanding sign shall be located at least seventy-five (75) feet from any other freestanding sign on the same side of the street; provided that a monument sign may be located within twenty-five (25) feet of another freestanding sign. Separation requirements may be reduced as approved by the Administrative Officer upon a written finding that the requirement cannot be met due to the location of existing signs on separate, but adjoining lots; provided that such reductions shall be the minimum required to maintain the greatest separation possible from existing signs. Projecting And Under Canopy Signs. Projecting signs shall not project more than five and one-half (5½) feet beyond the face of the building. Projecting signs shall be a minimum of ten (10) feet above the level of any sidewalk from the bottom of the sign. Any projecting sign within twenty-five (25) feet of a street or alley intersection shall be a minimum fourteen (14) feet above the sidewalk measured from the bottom of the sign. Under canopy signs of greater than four (4) square feet shall be rigidly mounted and there shall be eight and one-half (8½) feet of clearance between the base of any rigidly mounted under canopy sign and the sidewalk or grade. There shall be a minimum clearance of seven and one-half (7½) feet between the base of any non-rigidly mounted under canopy sign and the sidewalk or grade. Projecting signs and under canopy signs shall be limited to no more than one (1) per tenant on a property and each tenant shall have no more than one (1) projecting sign or under canopy sign. Banners. All business banners shall be maintained according to City ordinances. To determine compliance with the maximum allowable sign areas permitted under this Chapter, the area of a sign shall be considered the area of the sign face unless otherwise stated. Sign face area. 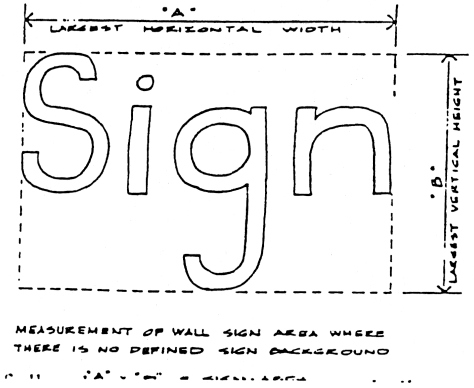 The area of a sign face shall be computed as the area within the smallest rectangle enclosing the limits of a sign face or the combination of the areas of all such rectangles delimiting each sign face, together with any frame or material, texture or color forming an integral part of the sign face or used to differentiate the sign face from the structure upon which it is placed. 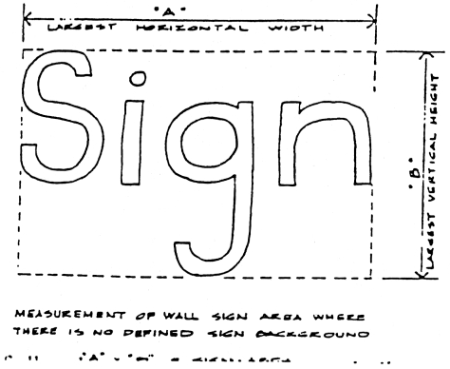 The computation of the area of a sign face shall not include the structure, supports or uprights on which the sign face is placed or any portions of a sign structure which are not intended to contain any message or idea and are purely structural or decorative in nature, other than those portions contained within the rectangle that delimits the sign face. For any sign on which the words, letters, figures, symbols, logos, fixtures, colors or other design elements routinely change or are intended to be changed from time to time, the sign face area shall include the entire area within which any words, letters, figures, symbols, logos, fixtures, colors or other design elements may be placed, together with any frame or material, texture or color forming an integral part of the sign face or used to differentiate the sign face from the structure upon which it is placed. 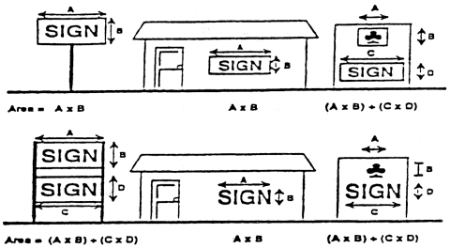 Sign structure area. The area of a sign structure shall be computed as the area within the smallest rectangle enclosing the limits of the surface of a sign whereon the sign face may be placed or contained, including all portions of a sign structure that provide a background for the sign face but are not intended to contain any message or idea and are purely structural or decorative in nature. 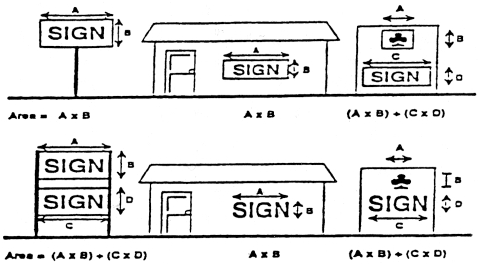 Any open space contained within the limits of the rectangle delimiting the sign face or sign structure shall be included in the computation of the area of the sign structure. For multi-faced signs. When the sign face surfaces are parallel (back to back) or where the interior angle formed by the faces is forty-five degrees (45°) or less, the area of the sign shall be taken as the area on the largest side. For all other multi-faced signs, the area of the sign shall be the total area on all sides that can be viewed at one (1) time from any angle. Table 420-1 set out in Section 420.160 presents the type of signs and advertising devices permitted in each zoning district and Table 420-2 set out in Section 420.170 presents the maximum number, size, height and other restrictions relating to specific signs and advertising devices that are permitted in each zoning district. In addition to the specific signs and advertising devices permitted in each zoning district, the following signs and advertising devices shall be allowed in all zoning districts (or in the zoning districts as indicated) under the conditions noted for each type of sign. Miscellaneous directional signs. Entrance/exit signs may be located at driveways that provide access into or from the property. There shall be no more than two (2) entrance/exit signs per driveway and each shall not exceed eight (8) square feet in sign area nor be more than four (4) feet in height. Election. Initiation upon the last day of qualification of candidates or certification of a ballot question and termination upon the election of a candidate to office or resolution of a ballot question. Real estate sale or lease. Initiation upon the actual availability of the property or premises for sale or lease and termination upon execution and acceptance of a final contract for the real estate transaction. Building construction or renovation. Initiation upon issuance of a building permit and termination upon issuance of the certificate of occupancy or approval for connection to electric power for the work authorized by the building permit. Single-family and two-family residences. Temporary event signs located on properties occupied by or zoned for single-family or duplex residences shall not exceed six (6) square feet in sign structure area and five (5) feet in sign height. Multi-family and non-residential uses. Temporary event signs located on properties occupied by or zoned for multi-family or non-residential uses shall not exceed thirty-two (32) square feet in sign structure area and eight (8) feet in sign height. Materials. All subdivision monument signs shall have a masonry or concrete substructure with surfaces of clay brick, split-face concrete block, stone or stucco; and the surfaces shall not be painted. Lighting. Any lighting shall be designed to minimize glare in all directions to the greatest extent possible. High intensity lights, such as floodlights, shall not be used. Landscaping. Landscaping shall be required at the base of the subdivision monument sign that shall be designed to blend and harmonize the subdivision monument sign with the surrounding natural or built environment. Proposed landscaping shall be identified at the time a sign permit is requested. Landscaping materials shall not block the sign face. Billboards targeting messages at drivers on primary highways within the City have a significant adverse impact on the safety of the traveling public when such structures because of their size, lighting, spacing, location, height or design distract or confuse travelers, interfere with vision or obscure traffic signs or signals. Billboards targeting messages at drivers on primary highways within the City also have a significant adverse aesthetic impact on the community when such structures dominate the surrounding environment both visually and physically with their large sizes, bright lighting, close spacing, intrusive locations and great heights. The adverse aesthetic impact of billboards can be especially harmful at entryways to the City, which are a visitor's first impression of the community. The erection and placement of billboards along primary highways within the City are subject to reasonable regulations relative to size, lighting, spacing, location and height to avoid adverse safety and aesthetic impacts. Avoiding such adverse impacts is intended to further the substantial public interest in protecting private investment in adjoining properties and public investment in primary highways, promote the recreational value of public travel, preserve the natural beauty of the community, provide a favorable first impression of the community and promote the safety of public travel. Conditional Use Permit Required For A Billboard. In addition to complying with the terms of this Chapter, billboards are designated a conditional use and a conditional use permit shall be obtained in accordance with the procedures set forth in Section 420.130 prior to the erection or installation of any billboard. Billboards shall be located only on private property. A billboard shall not be located closer than one thousand four hundred (1,400) feet from any other billboard. Spacing shall be determined based on other signs that have received a conditional use permit or that are signs established as lawful non-conforming signs. Signs which have received prior authorization or that are lawful non-conforming signs shall have priority over a later applicant in determining compliance with the spacing restrictions. Where two (2) different applications conflict with each other, so that only one (1) of the applications may be granted, the first (1st) application received by the Administrative Officer will be the first (1st) considered for approval. The second (2nd) application shall remain pending until resolution of the first (1st) application. The second (2nd) applicant shall be advised in writing if the first (1st) application considered is granted and the second (2nd) application shall be automatically denied. If the first (1st) application is denied, the second (2nd) application shall then be considered. To preserve the natural beauty and promote the recreational value of public travel in the City, billboards shall not be located within one thousand five hundred (1,500) feet of a corporate boundary of the City. Billboards shall not be located adjacent to or within one thousand five hundred (1,500) feet of any interchange, intersection at grade or safety rest area that is existing or approved for construction. This distance shall be measured from the beginning or ending of the pavement widening at the exit from or entrance to the main traveled way or, if there is no pavement widening, then from the midpoint of the intersection. To preserve adjoining property values and avoid adverse aesthetic impacts, billboards shall not be located within one thousand five hundred (1,500) feet of land zoned for residential purposes. Billboards shall be permitted only within six hundred sixty (660) feet of the nearest edge of the rights-of-way of the following primary highways: U.S. Highway 61 and U.S. Highway 54. Billboards shall be permitted only in the following zoning districts: "B-1" and "I". No billboard shall be permitted to be mounted, attached or affixed to a building rooftop or the walls of any building. Billboards shall not include any revolving or rotating beam or beacon of light that simulates any emergency light or device. Billboards shall not include any flashing, intermittent or moving light or lights. Billboards may be lighted by external lighting, such as floodlights, thin line and gooseneck reflectors, provided the light source is directed upon the sign face of the billboard and is effectively shielded so as to prevent beams or rays of light from being directed into any portion of the main traveled way of the highway or into any portion of adjacent properties and the lights are not of an intensity so as to cause glare, impair the vision of the driver of a motor vehicle or otherwise interfere with a driver's operation of a motor vehicle. Billboards shall not be illuminated so as to interfere with the effectiveness of or obscure an official traffic sign, device, or signal. Billboards shall not have a maximum average lighting intensity level that exceeds twenty (20) foot-candles. Size Of Billboards. Billboards shall not exceed a sign structure area for any one (1) sign face of eight hundred (800) square feet with a maximum height of thirty (30) feet and a maximum length of sixty (60) feet, inclusive of border and trim, but excluding the base or apron, supports and other structural members. The maximum size limitations shall apply to each side of a sign structure and sign faces may be placed back to back, double faced or in a V-type construction with not more than two (2) sign faces to each facing, but the sign structure shall be considered as one (1) billboard. Setbacks And Height Of Billboards. At least ninety (90) feet from any other structure that would require a building permit for construction. To provide a further safety zone to prevent injury or property damage from collapse of billboards caused by acts of nature or other causes, billboards shall not exceed thirty (30) feet in sign height measured above the rights-of-way grade from which the billboard is intended to be viewed. In cases where the grade at the location of the proposed billboard is higher than the right-of-way grade adjacent to which the billboard is located, the overall height of the sign structure shall be lowered as a condition of granting a permit to prevent the billboard from unreasonably detracting from the visibility of other neighboring signs or properties. The application for a conditional use permit for a billboard shall contain documentation to the satisfaction of the Administrative Officer that the applicant has secured the legally enforceable right to prevent the erection of structures within the setback zones. No building permit shall be issued for construction of any building within the setback clearance zone. Service Drives To Billboards. Billboards shall be accessible by means of a service road that is internal to the lot or parcel on which the billboard is located. All vehicles, equipment and personnel used to build, service, maintain and repair billboards shall confine their activity so as not to interfere with pedestrian or vehicular traffic on public roads. Additional Information Required Prior To Permitting Of A Billboard. Billboards shall not be permitted by the City until a permit has been issued by the Missouri Highway and Transportation Commission. Billboards shall not be permitted before the applicant has submitted a sign survey to indicate the relative vertical and horizontal distances between the proposed billboard and all principal freestanding sign within one thousand five hundred (1,500) feet. If by reason of height, size or spacing the proposed billboard creates a significant disharmony with a principal freestanding sign within one thousand five hundred (1,500) feet or unreasonably detracts from the visibility of other neighboring signs or properties, the City may require reasonable modification of the billboard's dimensions to cure these deficiencies as a condition of granting a conditional use permit. Any sign or advertising device that provides notice of a temporary event or any other temporary purpose that has occurred shall be deemed to have been abandoned. Any sign or advertising device that fails to meet the maintenance requirements of this Chapter shall be deemed to be abandoned. Illegal signs may be removed immediately by an order of the Administrative Officer. Signs or advertising devices that are deemed to be abandoned or otherwise found to be in violation of this Chapter shall be removed by the owner of the sign or advertising device or the owner of the premises within thirty (30) days from the written notice by the Administrative Officer. The Administrative Officer shall have the discretion to grant an additional thirty (30) days for the required improvements to be made, provided that the Administrative Officer determines that substantial progress is being made to correct the deficiencies and a written request for an extension is received at least five (5) working days before the end of the original notice period. Any sign or advertising device not removed within the time period required by this Subsection may be removed by the City and all costs charged to the owner of the premises upon which the sign or advertising device was located or the owner of the sign or advertising device. Should any sign or advertising device become unsecured or in danger of falling or otherwise unsafe in the opinion of the Administrative Officer, the owner or person or firm maintaining the sign or advertising device shall, upon written notice from the Administrative Officer, forthwith in the case of immediate danger and in any case within ten (10) days remove such sign or advertising device or secure same in a manner approved by the Administrative Officer. Any such sign or advertising device not removed or secured within ten (10) days from the written notice may be removed by the City and all costs charged to the owner or agent or person having beneficial interest in the building or premises upon which the sign or advertising device was located or to the owner or agent or person having beneficial interest in the sign or advertising device. If any sign or advertising device is installed, erected or constructed in violation of this Chapter, the owner or person or firm maintaining the sign or advertising device shall, upon written notice from the Administrative Officer, within ten (10) days, remove the sign or advertising device or bring same into compliance with this Chapter. Any sign or advertising device which is not removed or properly altered within ten (10) days from the written notice may be removed by the City and all costs charged to the owner, agent or person having beneficial interest of the building or premises upon which the sign or advertising device was located or to the owner or agent or person having beneficial interest in the sign or advertising device. Purpose. Within the City, certain existing signs or advertising devices which were lawful prior to the adoption or amendment of this Chapter are prohibited under the terms hereof. This Section is intended to declare such non-conforming signs to be incompatible with the permitted uses in each zoning district and must be removed within ninety (90) days of notice by the Administrative Officer. Existing permanent signs in use in residential districts shall not be affected by this Chapter except that should a non-conforming sign be removed, replaced or substantially altered, such sign shall be brought into conformity with this Chapter. Any permanent non-conforming signs in use in agricultural, business and industrial zoning districts shall not be affected by this Chapter except that any such sign structure, including the sign supports, but excluding the sign face, which is removed, replaced or substantially altered shall be brought into conformity with this Chapter; provided that any permanent non-conforming sign that is damaged through no fault of the owner may, upon issuance of a permit by the City, be repaired (restored to the original condition without being expanded, enlarged or increased in intensity). Any permanent non-conforming signs in use in agricultural, business and industrial zoning districts that exist in a multi-tenant building which has not had uniform sign standards approved by the Planning and Zoning Commission shall be allowed to remain until such time as they are removed, replaced or substantially altered; provided that any permanent sign for a multi-tenant building that is damaged through no fault of the owner may, upon issuance of a permit by the City, be repaired (restored to its original condition without being expanded, enlarged or increased in intensity). Temporary Signs. Existing temporary signs shall have ninety (90) days after the effective date of this Chapter to be brought into compliance. Abandonment Or Discontinuance. In the event that the use of a non-conforming sign or sign structure ceases to be used as a sign or does not display or advertise the name, message or logo of a business currently located or product currently sold on the lot or premises on which the non-conforming sign is located or is otherwise discontinued for a period of ninety (90) days, regardless of any reservation of an intent not to abandon or to resume such use, the non-conforming sign shall be deemed abandoned and shall be ordered brought into conformity or removed within the time period set forth in the City's notice pursuant Section 420.100. In Use — Defined. A sign structure is "in use" for the purposes of this Section if the sign advertises a business currently conducted or a product currently sold on the premises or lot. Conditions. Sign permits shall be required at the time that any permanent sign is installed as provided in this Chapter and at the time that any such existing sign is altered. Alterations shall include items such as changing colors, sign face wording or replacement of major parts or supports or modifications to the electrical components. Applications for permits shall be made upon forms provided by the City Clerk. Exact wording and coloring of sign message property owner's approval fee. Applicants for all building signs having a sign face area greater than six (6) square feet, all freestanding signs having a sign structure area greater than fifteen (15) square feet and all other signs over fifty (50) square feet in area shall obtain a building permit. Applicants for any sign or advertising device containing electrical components shall obtain an electrical permit. Fees. Fees as may be adopted by the Board of Aldermen and shall be placed on file with the City Clerk shall be paid at the time a permit is applied for. Time limits. If the work authorized by a permit has not been completed within six ( 6) months after the date of approval, such permit shall become null and void and a new permit shall be applied for and issued prior to erecting the sign. Completion. The erector or installer of the sign or advertising device shall notify the Administrative Officer within fourteen (14) days of the completion of installation. The Administrative Officer shall within fourteen (14) additional days take, develop, date and file appropriate colored pictures of the sign or advertising device. Said file shall be maintained by the Administrative Officer and shall be open for public inspection during normal business hours thereafter. Intent And Purpose. The purpose of the conditional use permit procedure is to provide the City with a procedure for determining the appropriateness of a proposed sign or advertising device not authorized as a matter of right by this Chapter. The appropriateness of the sign or advertising device shall be determined in consideration of surrounding uses, activities and conditions of the site and of surrounding areas. Based upon this determination, the Board of Aldermen may decide to permit, reject or permit conditionally the sign or advertising device for which the conditional use permit is sought. Authorization. The Board of Aldermen may authorize by ordinance, under prescribed conditions the construction of any sign or advertising device that is expressly permitted as a conditional use; however, the Board of Aldermen shall retain full authority to deny any application for a conditional use, to impose conditions on the sign or advertising device or to revoke any approval based upon a finding that an established conditional use has become unsuitable and incompatible with the surrounding area or that the conditions of approval are not being observed. An applicant for conditional use permit shall file with the City Clerk eight (8) copies of an application on a form provided by the Clerk. The application shall contain such information and supporting documents as the Board of Aldermen may prescribe by regulation. At the time an application for a conditional use permit is filed, the City Clerk shall require the applicant to pay to the City a fee according to a schedule established by the Board of Aldermen and on file in the offices of the City Clerk and upon payment of the fee, shall transmit the application and supporting materials received to the Administrative Officer. Within twenty-one (21) days the Administrative Officer shall determine if the application complies with all submission requirements. If the application complies, copies shall be forwarded to the Board of Aldermen. If the application is deficient, the Administrative Officer shall notify the applicant of the deficiency and the applicant shall have an additional twenty-one (21) days to remedy the deficiency. Within sixty (60) days of receipt of the application from the Administrative Officer, the Board of Aldermen shall set a date for a public hearing on the application and notice of the time and place of the hearing shall be given at least fifteen (15) days prior to the hearing by publication in a newspaper having a general circulation in the City. The Board of Aldermen may authorize a conditional use permit after holding a public hearing on the application by a simple majority vote. The Board may also add any restriction or condition the Board of Aldermen feels appropriate by simple majority vote. Will be compatible with the surrounding area and thus will not impose an excessive burden or have a substantial negative impact on surrounding or adjacent uses. Conditions And Restrictions. In approving a conditional use permit, the Board of Aldermen may impose conditions and restrictions as necessary to assure that the standards and the general intent of this Chapter are complied with. The Board of Aldermen, in approving a conditional use permit, may specify that any future enlargement or alteration to the sign or advertising device must be approved by the Board of Aldermen as an amendment to the conditional use permit before the enlargement or alteration may be undertaken. No conditional use permit granted by the Board of Aldermen shall be valid for a period longer than one (1) year from the date granted, unless within such period erection or installation of the sign or advertising device is commenced. The Board of Aldermen may grant extensions not exceeding one hundred eighty (180) days, upon written application, without notice or hearing. The Administrative Officer shall be responsible for the enforcement of this Chapter and may at any reasonable time inspect any sign or advertising device regulated by this Chapter. Written Notice To Be Given Of Violations. Any person aggrieved by the notice shall have a right to an appeal pursuant to Section 420.150. Signs Not Brought Into Compliance May Be Removed By Administrative Officer. Except in the event of a request for appeal, if the violations set out in a written notice have not been corrected within the specified time period after delivery of the notice, the Administrative Officer may deem the non-complying sign or advertising device a nuisance and may remove such sign or advertising device. Costs To Sign Owner, Premises Owner Or Sign Erector. The cost of repair or removal shall be a joint and several obligation of the owner of the sign or advertising device and/or the owner of the property on which the sign or advertising device is located. Expenses Incurred To Be Assessed As Lien On Property. In the event of failure by any party to reimburse the City within sixty (60) days for the cost incurred for repair or removal ordered by the Administrative Officer, the Board of Aldermen shall certify the charges for repair or removal to the City Clerk as a special assessment represented by a special tax bill against the real property on which the sign had been erected. The tax bill shall be a lien upon the property and shall be enforced to the same extent and in the same manner as all other special tax bills. The assessment shall bear interest at the rate of eight percent (8%) per annum until paid. Persons Owing Costs Of Sign Repair Or Removal Not To Be Issued Further Sign Permits. The Administrative Officer shall not issue any further permits to persons refusing to pay costs assessed for the removal of illegal signs nor to agents or representatives of such persons. Review Of Administrative Officer's Orders. The Board of Adjustment is empowered to review or modify the Administrative Officer's order or determination with respect to signs covered by this Chapter and to that end shall, during appeal, have all the Administrative Officer's power. In addition, the Board of Adjustment hear appeals and may grant variances from the provisions of this Chapter as hereinafter provided. Guidelines For Overturning Or Modifying Administrative Officer's Decision. The Board of Adjustment shall, in considering appeals from the Administrative Officer's order or determination, establish that the sign or advertising device or application in question complies with all the requirements of this Chapter. If it is determined that the Administrative Officer's application of this Chapter to the appellant's sign or advertising device or request for a permit is erroneous, then the Board of Adjustment may overturn or modify the Administrative Officer's decision. the permittee would be subject to undue hardship; provided that undue hardship shall not result from a mere loss of a possible advantage or convenience to the applicant. The Board of Adjustment's decision on an appeal shall be incorporated on the sign permit by reference to the decision number and date of decision. Applications. Applications for review of the Administrative Officer's order and for variances shall be made upon forms provided by the City Clerk and shall be received within fourteen (14) days of delivery of any written order. Supporting Regulations. Insofar as they are applicable and consistent, the provisions of Chapter 405, Article V "Board Of Adjustment — Appeals — Variances", pertaining to the Board of Adjustment as provided in this Chapter, shall be applicable to appeals taken to the Board of Adjustment for variances or interpretations of this Chapter. Editor's Note — Table 420-2, Sign Regulations is included as an attachment to this chapter. Editor's Note — Table 420-3, Number, Dimension, Location and Duration of Temporary Signs is included as an attachment to this chapter.